01 Nov 2018 --- Colgate has partnered with UK recycling company TerraCycle to enable consumers to recycle their oral care products and packaging. The program allows consumers to recycle any brand of toothbrush, toothpaste tubes and caps, outer packaging, electric and battery toothbrush heads and toothpaste cartons for free, while raising funds for the school, charity or non-profit of the senders choice. Speaking to PackagingInsights, a TerraCycle spokesperson noted that prior to the scheme launching, oral care products and packaging was one of the most frequently requested categories for recycling at TerraCycle. Oral care products are notoriously “difficult to recycle,” with products often containing a range of different plastics and materials, such as rigid and flexible plastics and bristles. Such items have not been recyclable traditionally through UK recycling systems and therefore end up in landfills or are incinerated. “Oral care products are hard to recycle, with innovation urgently required to reduce the volume of plastic being sent to landfill, incinerated and leaking into the environment,” Juliet Phillips, Ocean Campaigner at the Environmental Investigation Agency, tells PackagingInsights. In the new system – Oral Care Recycling Programme – TerraCycle will receive toothbrushes, toothpaste tubes and caps, outer packaging and cartons. They will be separated by composition, shredded and melted into hard plastic pellets that can be remolded to make new recycled products such as benches and construction applications, which reduces the need to create new virgin plastics. The paper from the cartons will also be shredded to make new paper, the spokesperson explains. applications, which reduces the need to create new virgin plastics. TerraCycle will reward shipments of over 200 grams (which is approximately 15 pieces of oral care products and/or packaging) with TerraCycle points. 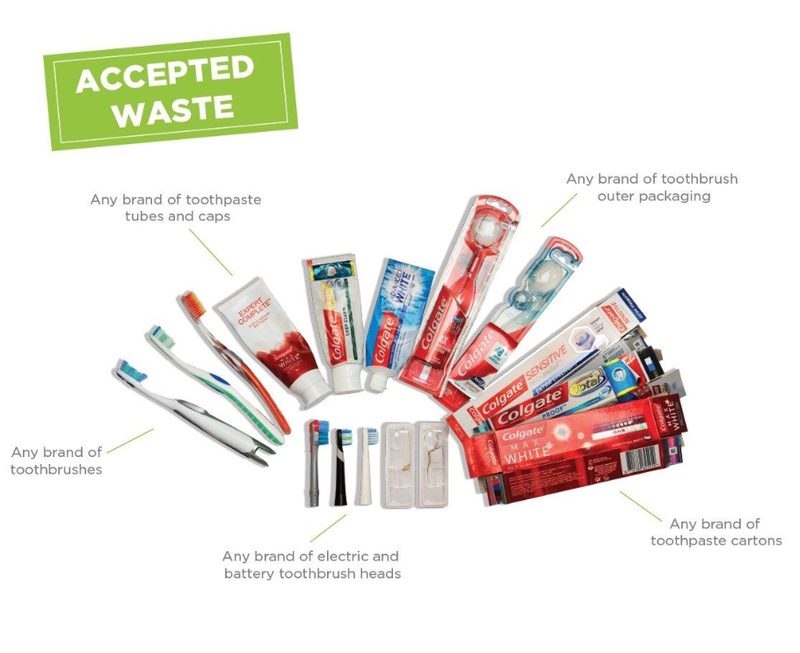 A shipment over 1kg in size (approximately 77 pieces of oral care waste) is rewarded with a 100 TerraCycle point donation to the school, charity or non-profit of the sender’s choice. As a response to the persistent tossing of oral care products into the trash that is destined for landfill, a range of environmentally friendly oral care products have hit the market. Such products have utilized bamboo as a sustainable material option, for example, and emphasized the possibility to use more reusable and refillable options. Such solutions have especially emerged since the issue of plastic waste in the environment has reached fever-pitch and both consumers and producers are looking for solutions that come with a sustainability tick. “Moving forward, Colgate and others should look to pioneer reusable and refillable oral care options, shifting into materials and formats that can be widely collected with other recycling streams,” Phillips tells PackagingInsights. The success of this recycling solution will largely rely on the participation of the public spreading the word among their family and friends. “With the global plastics issue high on the agenda for all, the Colgate Oral Care Recycling Programme promotes sustainability. We really encourage people to take advantage of the programme and recycle their oral care products and packaging via the programme and tell their friends and family about this new recycling initiative,” says Philip Durocher, General Manager Colgate, UK. Packaging headlines have been heavy with recycling news recently. Kellogg's launched a new solution to allow people to recycle Pringle cans, Unilever and Veolia have entered into a three-year collaboration focused on driving emerging technologies in waste collection and recycling infrastructure and the UK recycling industry is reportedly struggling under increased costs following China's ban on imported waste.